Once upon a time there lived a King. The King was named Otha Allen and was born in Watts, Arkansas circa October 1876 to parents William M. King and Octavia Elizabeth King, née Oliver. Mary Elizabeth Leming, a fair maiden born on 30 December 1874 to parents John Samuel Leming and Paralee Leming, née Cotton, soon captured the affection of Otha Allen King. 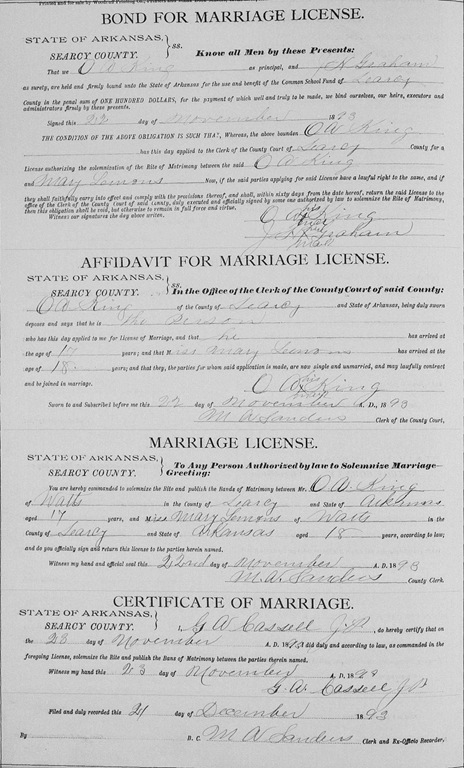 On 22 November 1893, seventeen years old Otha paid for a bond of marriage, which John Henry Graham signed as surety, to marry eighteen years old Mary “Lemons”, as her name was recorded by county clerk M. A. Sanders. The next day, the 23rd, Justice of the Peace G. A. Cassell, presided over the marriage. Some family trees on Ancestry record that Otha and Mary had as many as four children together, and some as little as one. My research suggests that some of the children were from Otha’s second marriage. For this first marriage, I have only Paralee Octavia Elizabeth King, a daughter born 31 October 1894, apparently named for both of her grandmothers. Between 1894 and 1896 Mary Elizabeth King, née Leming, died. I do not presently know where she is buried. I need a lot of help on this one. The only document that I have is the marriage record. Since Otha and Mary’s marriage was in 1893, and Mary’s death circa 1896, this family never showed up during a census year. How many children did they really have? What were their names? Birthdates? How did Mary die? Where is Mary buried? The Find A Grave entry for Patrick Bohannon lists his third wife as “Mary L. Lemons”, an apparent reference to Mary Elizabeth Leming. It is true that Patrick wed the widow of Otha Allen King, but it was not Mary. Not this Mary, anyway, as I will illustrate in Oh, A King and His Ladies, Part 2 and in The Many Wives of Patrick, Part 3. Ancestry.com: OneWorldTree; John Oliver Sr and Descendants by dbwilliamson; Haynes Family by GaryHaynes777. Find A Grave: Memorial for Patrick L. Bohannon. Rootsweb: Leming by WMunroe Munroe. Hi, I am a great grandchild of Perilee Octavia Elizabeth King. I was pleased to find this page! I have some information you may be interested in. You can contact me at kelliethomason@outlook.com. Thank you!! !